History repeated itself in Stockholm on Sunday when local driver Tomas Eriksson beat favourite Boyd Exell on home soil in the third leg of the FEI World CupÔ Driving. Exactly one year ago at the same venue, Eriksson triumphed and this year he was again too strong for the Australian FEI World Cup Driving Champion. However, Exell still claimed the full ten points because Eriksson drove with a wild card. Hungary’s Jozsef Dobrovitz came third in the Ericsson Globen Arena. For the first time in the history of the FEI World CupÔ Driving in Stockholm, a winning round for the top three drivers was included in the event, which resulted in two exciting rounds. The drivers revelled in the competition and commented that they hoped next year they would be able to win a Volkswagen, like those competing in Jumping and Dressage in Stockholm. Boyd Exell, who won the previous World Cup competitions in Hannover and Stuttgart with a wild card, was last to start in the World Cup competition in Sweden’s capital city. Exell had a slight misscommunication with his leader horses when he approached the first marathon obstacle and this cost him precious seconds. As Eriksson had driven a sensational clear first round, it was Eriksson who was in favour to start last in the winning round. Exell nearly made the same mistake again in the second round but corrected at the last moment. The 2010 World four-in-hand champion drove a fast clear round and put the pressure on Eriksson. It was clear however that double World Champion Tomas Eriksson felt at home in Stockholm with the local crowd cheering on the multiple Swedish champion. After his disappointing last place in Hannover, Eriksson replaced one of the leader horses in his team with an outdoor marathon horse and beat Exell’s time by over three seconds with a breathtaking round. It was the third title for Eriksson on home turf, having won in 2002 and 2009. Dobrovitz was determined to perform well in Stockholm. It was his third FEI World CupÔ Driving competition of the season and another crucial chance to qualify for the Final. Dobrovitz competes with a wild card in Budapest next week and has one more go for points in Mechelen at the end of this year. Dobrovitz put down a fast clear round with which he qualified for the winning round but in the final round he made some driving mistakes, knocking three balls down, which dropped him to the third place. Although Stockholm is already the third leg of the FEI World CupÔ Driving season 2010/2011, some of the qualified drivers have not started yet. In Stockholm, Fredrik Persson and Werner Ulrich had their first starts of the season. Ulrich performed well with a new small Lipizzaner gelding in the lead of his team, next to the trotter horse he used during last season. Persson used four outdoor horses, including the 22-year-old experienced LRF Davidoff who has been with Fredrik as a wheeler horse for 15 years. It was in fact in Stockholm in 1995 that Fredrik spotted the gelding at a driving event and not long after that, the horse came to the national equestrian center Flyinge where Fredrik works. The only driver who has not started yet is Ulrich’s compatriot Daniel Würgler. Würgler will drive his first competition in Budapest next week end. Sweden’s international course designer Dan Henriksson had designed a course with several sharp turns. The long lines and the bridge with fireworks caused much excitement for the large number of enthusiastic spectators. The disadvantage of the arena in Stockholm is that it is the smallest indoor arena used for World Cup competitions, so there is not much space. From next year there are plans to remove the arena boarding which will make the arena five metres wider. This will allow the 55-year old Henriksson, who has been responsible for the courses in Stockholm since the start of the FEI World CupÔ Driving in 2001, to make some changes in his course design. With 22 points, Jozsef Dobrovitz leads the standings after three competitions. Dutch drivers Koos de Ronde and IJsbrand Chardon follow in second and third. Boyd Exell has entered the standings after his first competition for World Cup points in Stockholm in the 4th place. 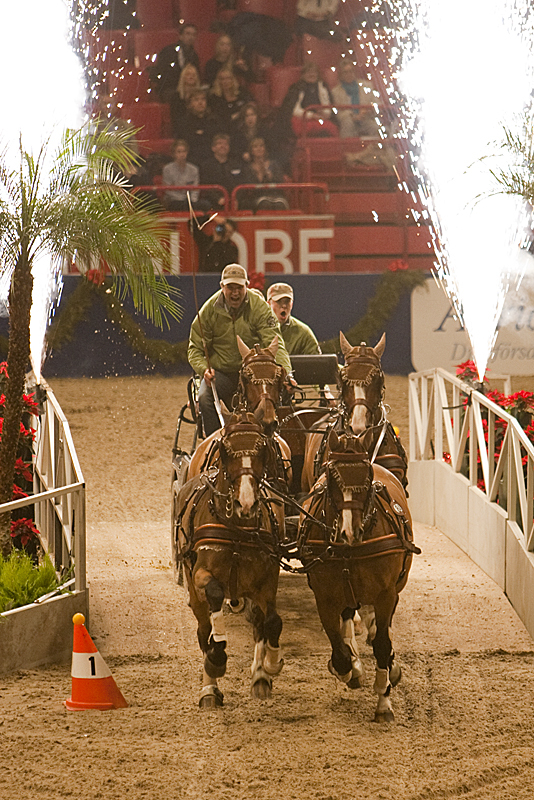 The 2010/2011 FEI World Cup™ Driving series now moves on to Budapest, Hungary on Sunday, 5 December.